To create a new pipeline, go to the Pipelines sub-tab of the Administration tab and click on the “Create a new pipeline within this group” link as shown in the screen shot below. Often you do want to specify a set of files that Go should ignore when it checks for changes. Repository changesets which contain only these files will not automatically trigger a pipeline. These are detailed in the ignore section of the configuration reference. Now that you have a pipeline with a single stage, lets add more stages to it. Click on the Stages tab. You will notice that a defaultStage exists. Click on the “Add new stage” link. Fill stage name and trigger type. Fill in the details for the first job and first task belonging to this job. You can add more jobs and add more tasks to the jobs. 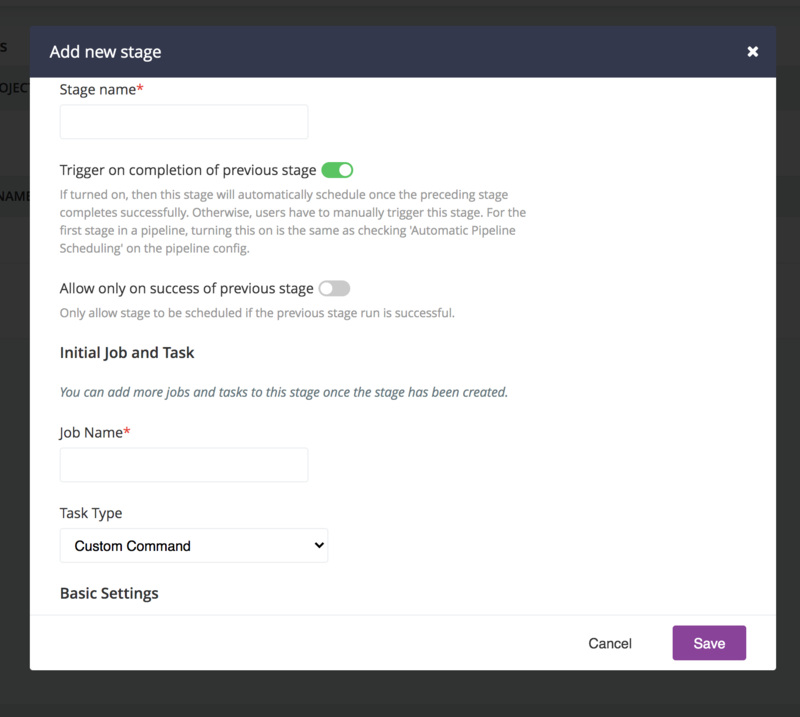 Clone pipeline functionality helps you create a new pipeline from an existing pipeline by giving it a new name. Typically when setting up a pipeline for a new branch, it is very useful to take an existing pipeline and clone it. If the user is a pipeline group admin, she can clone the new pipeline into a group that she has access to. 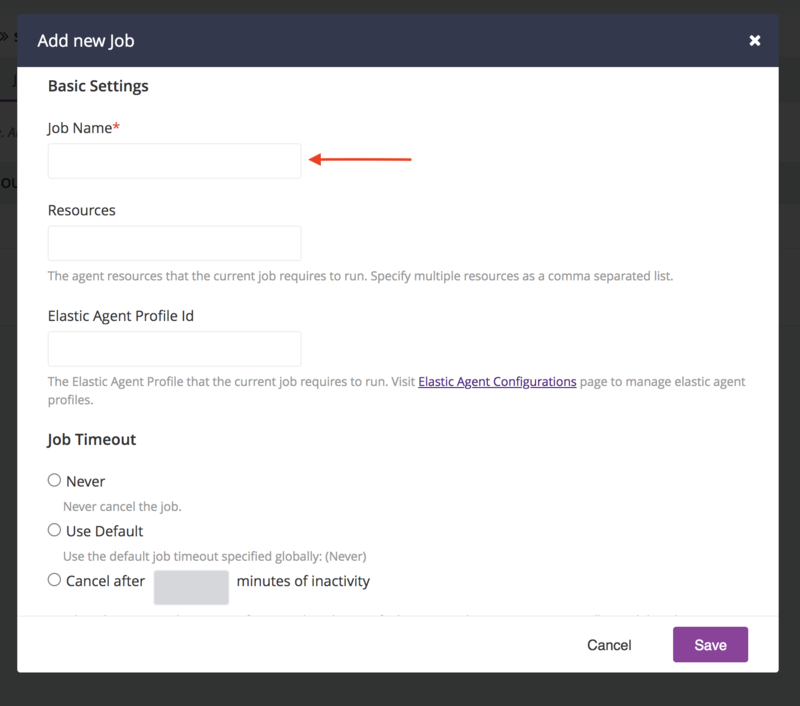 If the user is an admin she can clone the pipeline into any group or give a new group name, in which case the group gets created. In that row, click on the “Clone” icon. Deleting a pipeline removes an existing pipeline from the config. Warning: Pipeline history is not removed from the database and artifacts are not removed from artifact storage, which may cause conflicts if a pipeline with the same name is later re-created. In that row, click on the “Delete” icon. 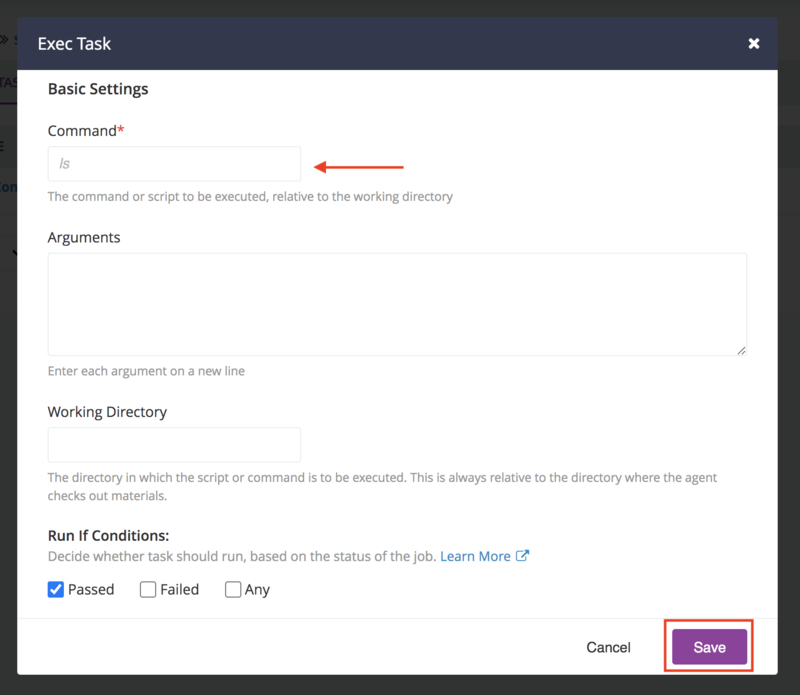 Templating helps to create reusable workflows in order to make tasks like creating and maintaining branches, and managing large number of pipelines easier. 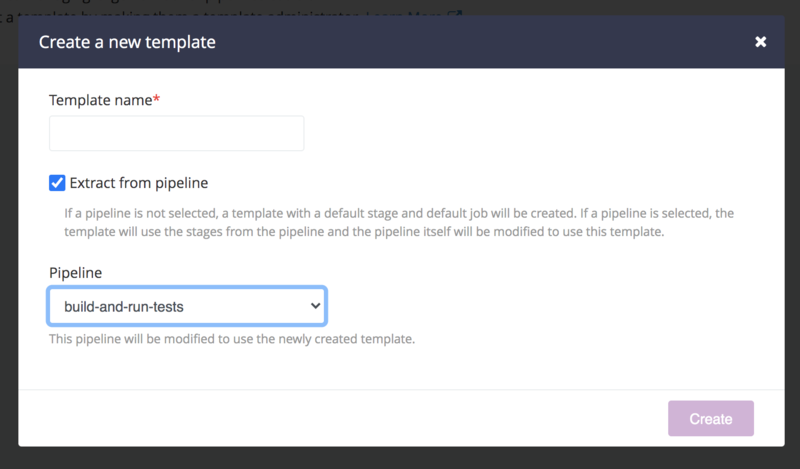 Pipeline Templates can be managed from the Templates tab on the Administration Page. 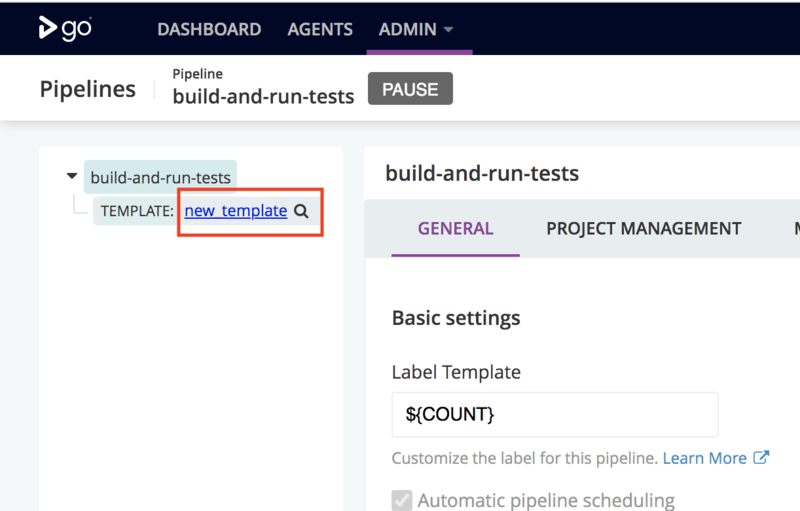 Clicking on the “Add New Template” brings up the following form which allows you to create a fresh template, or extract it from an existing pipeline. Once saved, the pipeline indicated will also start using this newly created template. A template can also be extracted from a pipeline using the “Extract Template” link. This can be found on the “Pipelines” tab in the Administration page. Create a template “my-app-build” by extracting it from the pipeline “app-trunk”, as shown in the previous section. Create a new pipeline “app-1.0-branch” which defines SCM material with the branch url and uses the template “my-app-build”. 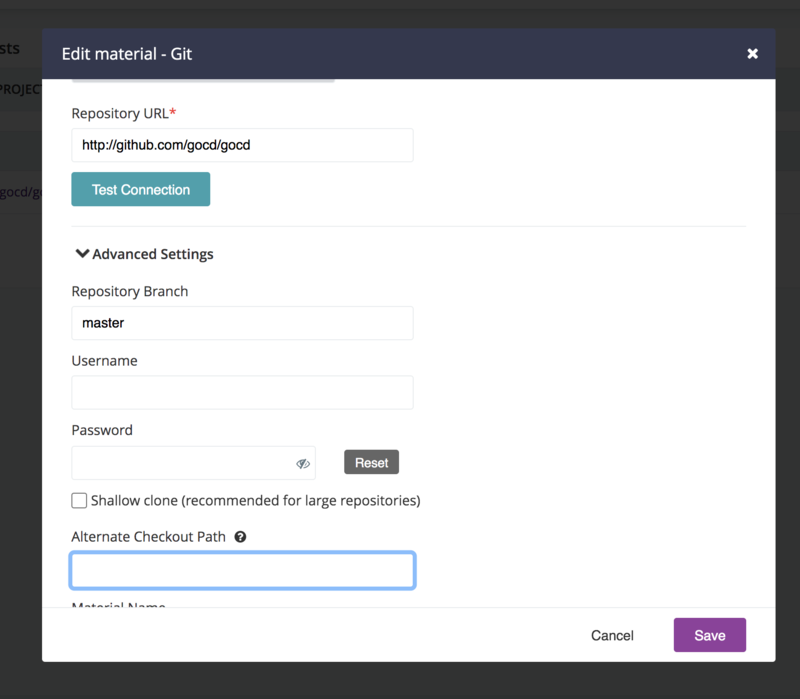 Go Administrators can now enable any Go user to edit a template by making them a template administrator. Template administrators can view and edit the templates to which they have permissions, on the template tab of the admin page. Template Administrators, will however not be able to add, delete or change permissions for a template. They will also be able to see the number of pipelines in which the template is being used, but not the details of those pipelines. 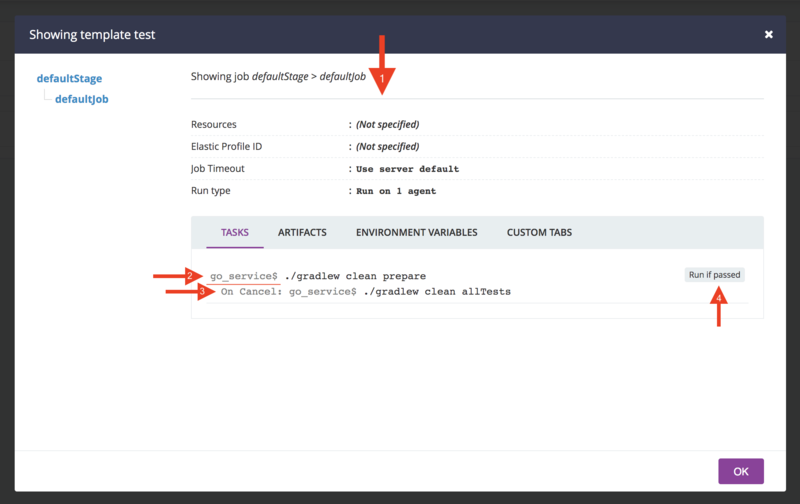 Pipeline Templates can now be viewed by Administrators and Pipeline Group Administrators while editing or creating a Pipeline. The pop-up shows the extract of the template “Services-Template” configured for the pipeline “Service_1”. Shows the details of the job “compile-job” configured for the stage “compile”. Indicates that the working directory set for the task is “go/service_1”, which is followed by the “\$” symbol and then the command. If any “On Cancel Task” has been configured, it will be indicated like this. Shows the “Run If Condition” for this task. By default, when one stage completes successfully, the next stage is automatically triggered by Go. However sometimes you don’t want the next stage to be triggered automatically. This might be the case if you have a stage that deploys your application to a testing, staging or production environment. Another case can be when you don’t want your pipeline to be automatically triggered by changes in version control. In these situations, you want the stage triggered by manual intervention. This can be done through manual approvals. If you add a manual approval to the first stage in a pipeline, it will prevent the pipeline from being triggered from version control. Instead, it will only pick up changes when you trigger the pipeline manually (this is sometimes known as “forcing the build”). You can control who can trigger manual approvals. See the section on Adding authorization to approvals for more details. There is support for collecting multiple pipelines into a single named group. See the section on Specifying who can view and operate pipeline groups for more details.